For the next few months at 5 Minutes for Books, Dawn is hosting the Children's Classics Carnival. The theme through December is reading books which have won an award (i.e., Caldecott, Newbery, etc.) I've decided to read books off our own home bookshelves to see which award winners we have. The problem is, I find myself adding to our bookshelves as we move along in this challenge! The problem is that I keep adding to my bookshelves because of this challenge. (Yes, I'll blame it on that.) Today's read, however, can also be blamed on some close friends of mine who loved the highlighted title for today - enough to actually include Chincoteague in their vacation spot this past year! I kinda wanted to know what they were talking about. Then, we you find a copy for $0.99 at Goodwill I mean, seriously! How are you supposed to resist? Especially when the book has a big, fat Newbery Honor Book stamped on the front cover?! Yes, you could hardly expect me to resist. I am not a typical fan of horse literature as I have mentioned before. 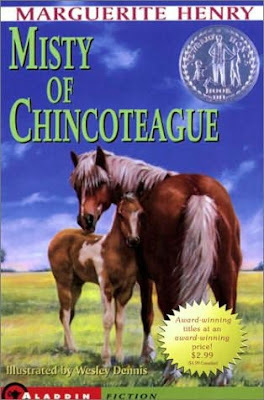 However, immediately upon opening up Misty of Chincoteague I was drawn into the story and kept yelling (in my head), "I LIKE this! I can't believe it!" as I read along. Paul and Maureen Beebe live with their grandparents on the Island of Chincoteague, which is off the coast of Virginia and Maryland. Next to Chincoteauge is another island by the name of Assateague. On Assateague Island lives a centuries-old band of wild ponies. Among them is the mysterious Phantom, a rarely seen mare that that always manages to avoid capture. Every year on Chincoteague Island they celebrate "Pony Penning Day" and the residents travel over to Assateague and round up the wild horses, keeping the young foals and selling them to local residents to be "gentled" and kept for use. Although Phantom has never been caught, Paul and Maureen determine that they will catch her on the next Pony Penning Day and keep her for their own. I don't want to spoil any surprises in case you haven't read the book so I'll stop there. "All the incidents in this story are real. They did not happen in just the order they are recorded, but they all happened at one time or another on the little island of Chincoteague." I originally though I'd just give this book a read and pass it on but it has staying power. We'll be holding on to this one, and looking for more Marguerite Henry books to add to our collection! To learn more about Pony Penning Day and other activities on Chincoteague and Assateague Island you can visit the Chincoteague Pony Swim website or the Chincoteague Island Travel Guide or just learn about the Chincoteague horses themselves. I can't handle books centering around animals, no matter what the animals. Exceptions: Animal Farm and Mrs. Frisby and the Rats of NIMH. We also went to Chincoteague after reading the books. LOVE that story. The sequels are :Stormy, Misty's Daughter, and Sea Star. I went through a horse book phase as a girl but somehow never read this one. I don't know how I missed it! Sounds familiar, though I'm not a horse book lover either. My mom read these books to us when we were young. Although, I remember Brighty of the Grand Canyon as being the favorite in our family. Maybe it's more geared toward boys and less girly horse book? Hey Alison, you might be right. I might like it because it IS geared more towards boys and not just girly horse girls. That could very well have been a huge contributing factor. Didn't think about that when I was reading but it makes sense! I remember reading these when I was a kid and loving them! There is more than one of the Chincoteague horses too. I was quite addicted to horse books as a young child, and this was one of the best. I don't remember if I read the sequels or not. At some point I need to revisit all of the old horse favorites.